After living in Asia for 3 years I've developed a hankering for the spicy and tangy fermented vegetables known as kimchi. We've made many batches of kimchi in our home, the refrigerator in our garage is literally full of our different variations, but I'd never thought to ferment Brussels sprouts. The tiny cabbages make for a beautiful presentation, especially when served with a Korean-themed dinner. 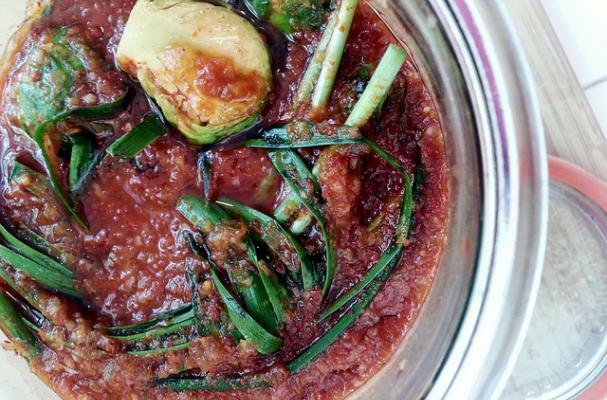 Make your kimchi and let it ferment for about 2 months. Allowing it to "brew" will deepen the flavors and give it that nice tang. Created by chef Jon Churan and featured in Bon Appetit magazine. We made slight adaptations to the original recipe. Combine 3.5 oz. salt and 2 quarts warm water in a large bowl, whisking to dissolve salt. Add Brussels sprouts and top with a plate to keep from being submerged. Let sit at room temperature 4 hours; drain. Rinse, drain, and place in a large bowl. Pulse onion, scallions, garlic, gochugaru, fish sauce, Sriracha, ginger, soy sauce, and coriander and fennel seeds in a food processor until smooth. Add to bowl with Brussels sprouts and toss. Transfer mixture to two 32-oz. canning jars, packing down to eliminate air gaps. Gently curl up 4 garlic chives (or green onion stalks) and tie in a loose knot (as shown in image) and place on top of sprouts. Combine remaining .7 oz. salt and 1 quart warm water in a large bowl, whisking to dissolve salt. Add pickling liquid to jars to cover Brussels sprouts, leaving at least 1” headspace. Cover jars with lids. Let sit out of direct sunlight at room temperature until kimchi tastes tangy and releases bubbles when stirred, 3–5 days. Chill and let ferment for about 2 month.